It’s pouring and windy and full of…weather…here in San Francisco. When it comes down to it, I prefer sunny, unbearably hot weather (I’m an anomaly). So after getting off the bus this afternoon I ran to my apartment, locked myself in my bedroom, and sat until my space heater filled the room. 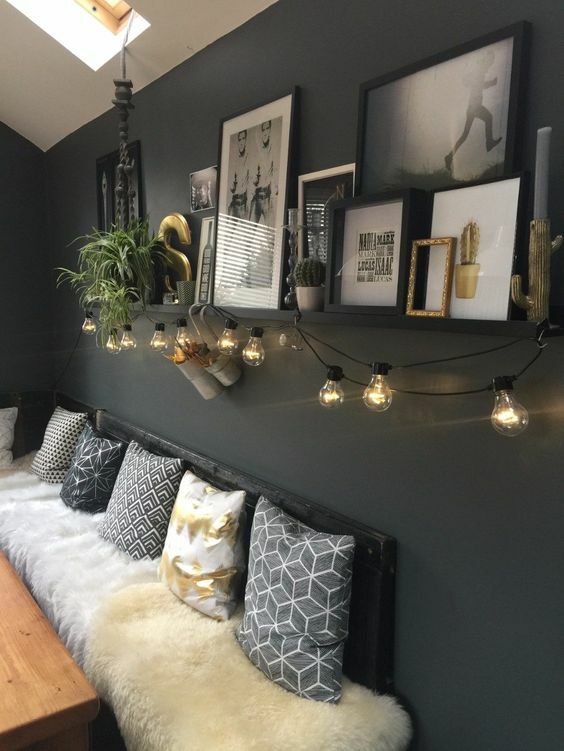 A few DIYs later, I skimmed my Pinterest feed for cozy, layered rooms and corners perfect for this kind of dreary-ness. My room is full of smaller vignettes like bookshelves filled with trinkets and books, or clusters of artwork. I love how you can tell a story and show your style through a single small corner by really layering it with personal treasures, objects, and textures. And often, these spaces become personal retreats where you can curl up with a book or your laptop. 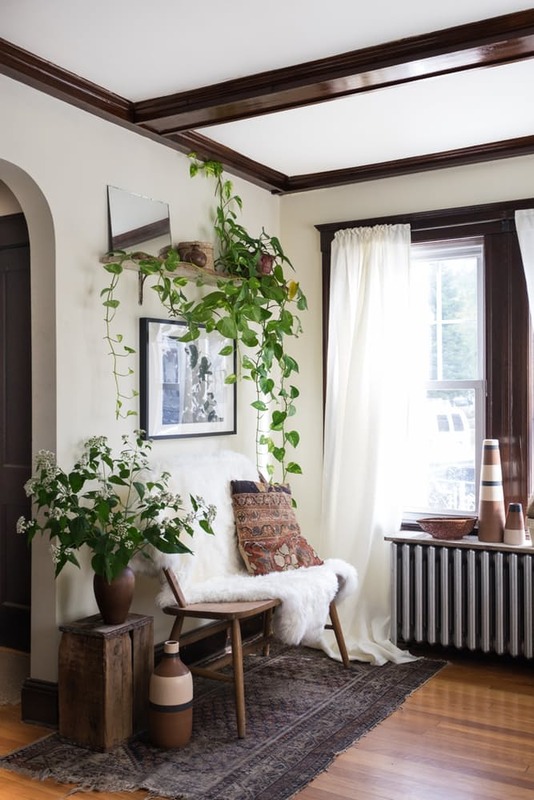 Currently these are some of the corners that make me want to redesign a small space where I can get cozy (and eclectic) for the Winter. I love love love this simple corner! This was my inspiration for this post. How could this not be the coziest, most beautiful space? First off, it’s is designed around the heater (what could be warmer? ), and second there are so many cozy draped elements that give it a very relaxed, bohemian feel. A furry sheepskin and pillow rest on a long bench, and all are surrounded by hanging vines and sunlight. 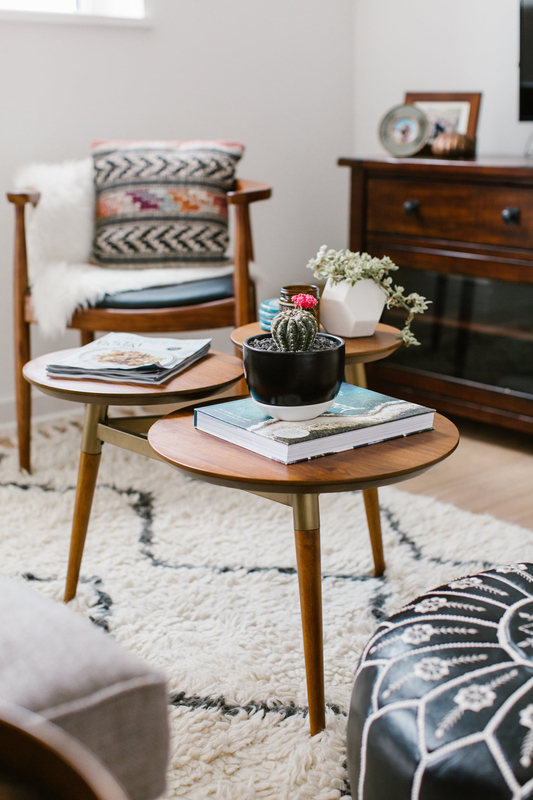 This is only a vignette because of its photo angle, but I love the sheepskin and Moroccan rug and pouf, and of course the gorgeous Mid-Century Modern coffee table in the center–plenty of places to sit and be comfy, with a small chair on one side to spend time to yourself. Also vintage pieces tend to give a space a lived-in feel. Creating a comfortable corner really comes down to a few things: layers of blankets and pillows, fur, and a place to display your books and favorite personal pieces. That or Scandinavian spaces. What’s that I was saying about having a place to display books? 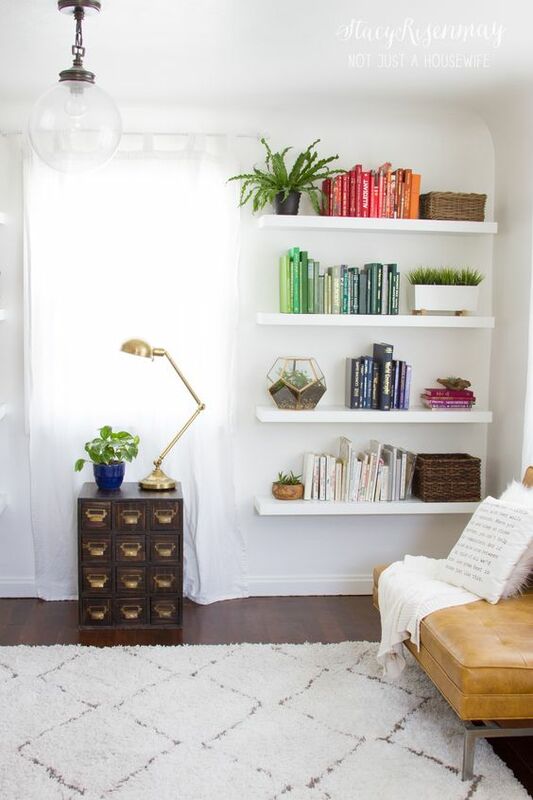 The floating shelves in this room and long bench create the perfect personal reading nook. 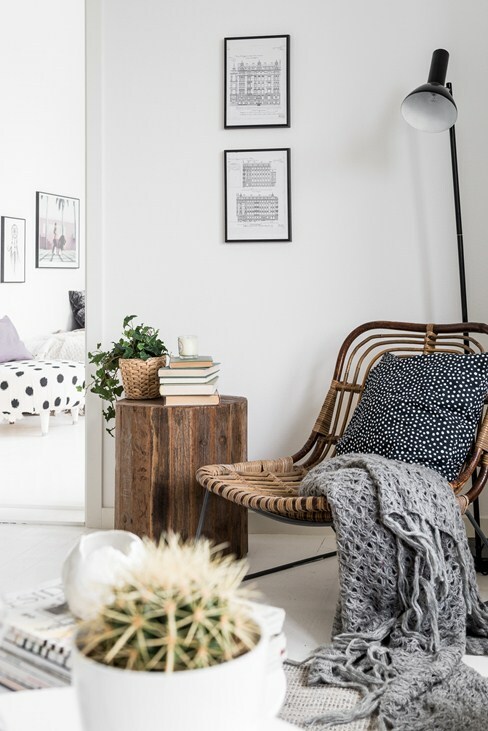 Oh, and stark white walls help keep a room nice and bright–ideal for a dreary winter! If white isn’t your thing, screw it–this dining space has black walls, plus a cluster of artwork, bright bistro lights, and plenty of soft sheepskins and throw pillows for cozy dining or alone time. The old armchair and ottoman trick–but seriously, this room is so inviting with its puffy patterned seating and colorful Boucherouite rug! 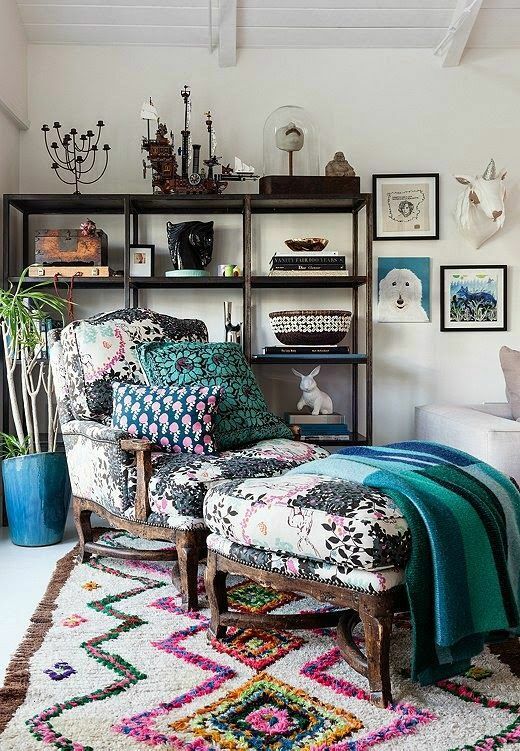 It’s the layers of textiles and collection of treasures I really adore about this space. 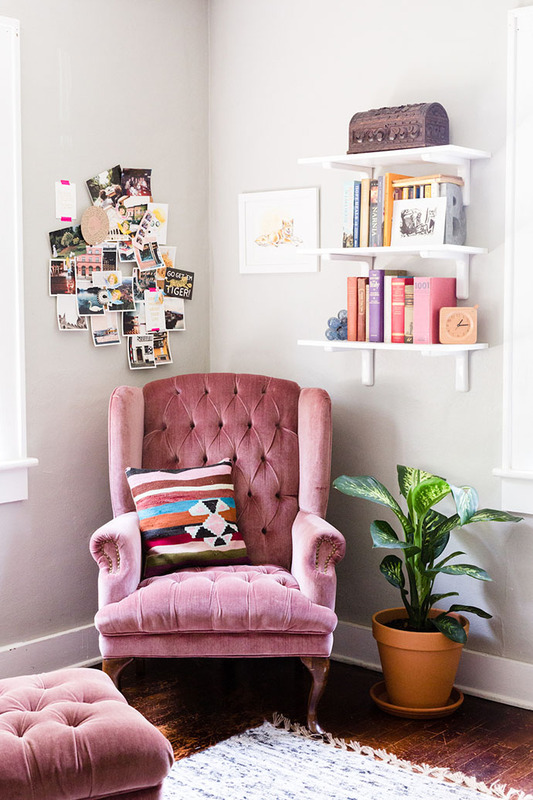 Always a fan of tufted velvet, this room is simply the coziest, brightest space with its pink vintage wingback chair and bookshelves. How do you get cozy at home during the Winter?